The Defense Advanced Research Project Authority (DARPA) Learning Locomotion project seeks to create algorithms that help multi-legged platforms learn to walk in varied terrain. DARPA will be handing out a series of $600K-$800K research grants to teach 6.6 pound, ten inch "Little Dogs" to walk. During the 15-month first phase of the "Learning Locomotion" project, DARPA wants the pooches to be able to travel .6 of an inch per second, and scale obstacles about 2.5 inches tall. For Phase II, those numbers should go up to approximately 3.8 inches and 5.7 inches, respectively. They sent a slamhound on Turner's trail in New Delhi, slotted it to his pheromones and the color of his hair. It caught up with him on a street called Chandni Chauk and came scrambling for his rented BMW through a forest of bare brown legs and pedicab tires. 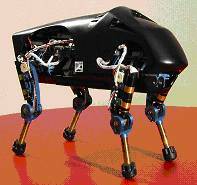 See an update on this story at BigDog Quadruped Robot Update. Read more at Robo-Puppies go to School and Learning Locomotion. Thanks to Winchell Chung for the tip on this story.